The twisting movements of the world economy can not be denied having a strong contraction of the Indonesian economy. Consequently embracing the open market economy system, through the process of import and export of goods, this is certainly very influential. 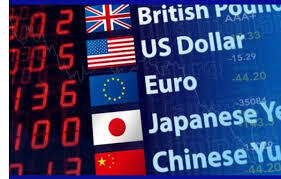 Currency exchange rates is one of them affected, where the exchange rate is a factor forming the selling price and buy a commodity in the market. Although it seems that today's world memorable no longer have limits, but in fact all countries in the world still have a limit with the currency exchange rates. This is a major driver of currency transactions between countries. What is the cause of the currency exchange transaction? Its causes are triggered by a limited resource factor in each country, so it is necessary to supply from other countries with excess resources. At this point, then inevitably every country must make transactions using the currency of each country. No less than 116 currencies in the world today. Unfortunately, the 116 currency types apply only in certain locations and places. For example, the Indonesian rupiah currency only applies in Indonesia alone, even with the euro currency is only valid in the countries of the european world there. Well, the critical question is, how can a country's currency be recognized and applied in another country? The answer to this big question, is heavily dependent on the demand and supply that goes in the money market. If the demand for a particular currency in the money market is high then the currency exchange rates becomes high and vice versa with the assumption that the amount of currency in circulation does not increase. As far as I know, if a country's currency exchange rates becomes higher, it will cause the export value of its commodity goods to increase more expensive and on the contrary its import value also shifts to a cheaper position. So what exactly is the source of the cause of the currency exchange rate is always moving up and down? Inflation shows an upward trend in commodity prices in a country. The impact, will affect the exchange rate of the country's own currency. Because in this moment will be a lot of money in circulation that is used to buy an item. If the goods produced in the country there is no problem, but if the goods purchased is the production of other countries, for example from the United States, then automatically oang who want to buy goods that require dollar currency. Well if you ask for too many dollars while the dollar amount available on the money market is only slightly, according to the law of demand and supply, the value of the dollar will rise and at the same time the value of the rupiah will fall. Central bank in a country, if in Indonesia is an Indonesian bank and In the United States called the fed is a state financial institution that controls things related to the exchange rates of a country's currency. 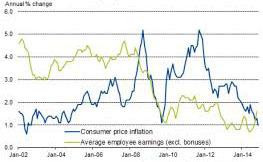 In the event of inflation, the monetary policy taken is to raise the interest rate banking. The goal, so that investors who have the capital is interested and interested in saving money in the bank. As a result, the amount of money in circulation will drop drastically, so the exchange rates of the country will strengthen. Not only is the government owed to other countries, but the public or familiar is said to be private sector is often also owed to entrepreneurs of other countries. Sitting the case, if the public sector debt is very large to another country, for example to Singapore, then when it wants to pay it will definitely need dollars in large quantities. Consequently, the exchange rates of the rupiah against the singapore dollar will creep up. Political factors come to think of it as common sense as the saying goes far from what. That is, political factors are not directly related to the rise and fall of currency rates. But indirectly, domestic political factors can turn into a culprit black and white ups and downs of currency exchange rates. Year 1998 is an example, where a massive demonstration of students who want to depose the power of President Soeharto at that time, it turns out that the exchange rate of rupiah against the dollar soared, almost touching Rp. 16,000 / dollar. the rupiah against the dollar was skyrocketing. The condition of trade between countries is illustrated through the glasses of trade. If the volume of a country's exports is greater than the volume of its imports, it means that the country receives an income that is termed foreign exchange. In contrast, if the volume of imports is greater than the export volume then that means the country's foreign exchange will be eroded for the benefit of shopping. As the volume of imports increases, we will need more foreign currency to pay, so that the exchange rate of the rupiah is also affected. Many people love to play the words by using the term currency exchange, when asked what is the currency exchange rates, they just silence a thousand languages. Currency exchange actually refers to the comparison between two currencies from different countries where expressed in units of value. Why should the currency be calculated? It's been explained at the beginning that every currency is only recognized for use in a particular place. If there are two countries that want to trade, say Indonesia and Australia, then to make smooth way of good trading intentions there must be a currency exchange between the two. The most fitting term for this is usually the foreign exchange rate. Unfortunately, the exchange rates can not be determined on the basis of an agreement between the two, there is a money market mechanism applicable by following the law of demand and supply. In Indonesia itself, the currency exchange system has 3 times made changes. Initially using a fixed currency exchange system, then switching using a controlled floating currency exchange system and finally with a free floating currency system. What is the reason until the change must be made 3 times, of course there are separate considerations of finance ministers and the Indonesian banks regarding the advantages and disadvantages of each currency exchange this system. 1. Eases during payment transactions. 4. Avoid global economic risks. There are only two known positions for trading. This position can be taken if your business instinct tells you in a small heart that the base currency rate will move up. This position can be taken if your instinct says in a small heart the base currency rate will move down. The intended currency is the base currency the first mentioned money symbolized in writing for example Rp / USD. Apart from that, to earn additional income from this currency rate then the condition of our instinct should be sensitive and accustomed to follow global economic issues. The root of the problem, the issue can bring good and bad influence on the movement of currency exchange rates. The issue of US central bank interest rates for example, if we ignore this issue and insist on trading currency of the rupiah pair with dollar by taking a buy position, that's suicide. Certainly the exchange rate of the rupiah will fall freely and the right position should be by taking a sell position. If circumstances like this happen to you that what is suspected at the beginning does not work perfectly, then you can immediately close the trade to avoid severe losses. Another principle of currency exchange trading also uses the term lot that shows how big the volume of transactions and the sale of currency that will be done. The amount of this lot you will fill in the order form when taking a trade position (buy / sell). To be able to fill this order form, then the first thing must be done is to sign a large contract to fit your finances. b.Both mini contracts, this type of contract allows you to trade currency transactions up to 10,000 USD. c.The three micro contracts, this type of contract allows you to trade in currency up to 1,000 USD. After the long peeling of the exchange rate at the beginning, then it is time we go in the long-awaited the hunters fortune. In the money market, the currency of each country in the world traded as a traditional markets. The goal, just one wants to reap the benefits of each change in the currency exchange rates itself. To be able to reap the profit and fill the coffers of the pocket left and right, then should be able to understand the basics of trading currency exchange rate is called forex trading. Although, briefly later you may not do own trading and buying the currency, but ust use the services of a broker. But the basic knowledge intake of currency exchange rates must be owned. A bit unique in the world of buying and selling currency exchange rate is the advantage can be obtained when the currency price rises and the price of the currency falls. Currently, in this currency exchange is done in pairwise pattern. 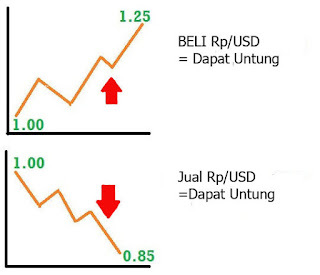 In the first picture, when taking a buy position for the rupiah currency pair against the dollar, it means that we buy dollars by selling dollars. We expect the rupiah we buy, the value will rise from the initial value trade 1.00. If it does not transverse so that the estimate can run smoothly for example to position 1.25 then the difference of 0.25 it is a profit. How to dilute this 0.15 pip into money? I assume that when doing trading foreign currency, with a sell position (profit 0.15 pip) you order as much as 2 lots with big contract value as much as 100.000 lot. So easy enough to know how much profit we can earn. An elementary school student can calculate if only using calculation formula like this. The good news, you have a very big chance to double the profits in this currency exchange market because the market location never closes 1 x 24 hours for 5 days. Why it can be like That's ? the answer, because there are time differences in the money market locations of some countries. Currently there are 4 currency trading locations namely Sydney (Continent Australia), Tokyo (Continental Asia), London (Continental Europe), New York (Continent America). Finally, my advice to get maximum profit from this currency exchange trading, start with the learning phase. Just use a meta data application that can be downloaded through the play store and start trading with virtual money.